Laughter is irresistibly contagious and a real medicine for the soul and health and as such, people who create such moments of laughter tend to be loved by many. Joe Gatto is the right deal when we talk of good humor. He is one of the characters on Impractical Jokers, a TV series of the New York troupe called The Tenderloins. The well-known Italian-American comedian, actor, and producer has consistently caught the eye of his followers with his unique sense of humor. From his popular TV show, Impractical Jokers to the other reality shows he’s been a part of, down to featuring on comic movies, there is no doubt that Joe has come to stay in mainstream comedy. Attaining fame away from his course of study, Joe has shown himself as being a free soul as he partakes in charity programmes and lots more. The amazing comedian and actor has a huge fan-base with over 760 thousand followers on Instagram and about 850 thousand followers on Twitter. Born Joseph Anthony Gatto on the 5th of June, 1976 in Staten Island, New York City, New York, USA, the comedian began his academic journey by attending Monsignor Farrell High School. He left for college at Long Island University (LIU), where he gained a degree in Accounting. Although he was good at what he studied, it is still amazing how the mathematically inclined young man became a world-class comedian. To unravel the mystery, it was revealed that Joe Gatto never had it mind to study accounting when he was younger. Apparently, the only reason why he got an accounting degree was that his father insisted that every company needs an accountant and you can work anywhere, coupled with the fact that he was good at math. Joe Gatto co-founded the comedy troupe ‘The Tenderloins’ in 1999 along with James Murray, Mike Boccio, and Sal Vulcano. They kicked off with comedy and initially earned fame through social networking platforms like Myspace, YOUTUBE, and Metacafe. Their big break happened in 2011 when they kicked off a hidden camera prank reality series named ‘Impractical Jokers’. The show expanded as the group began to embark on live tours from 2015 and the followership they received went through the roof. Joe Gatto took his career even higher by writing and starring in the 2009 TV movie The Tenderloins. He also appeared on the TV series Jokers Wild in 2014. Joe Gatto is of Italian descent and prides himself greatly on his big extended Italian family. He is the youngest of three children; his two sisters are Gina and Carla. His late father passed on in 1995 after suffering from Pancreatic cancer due to much consumption of alcohol. This stirred Joe’s mind toward abstinence from alcohol. 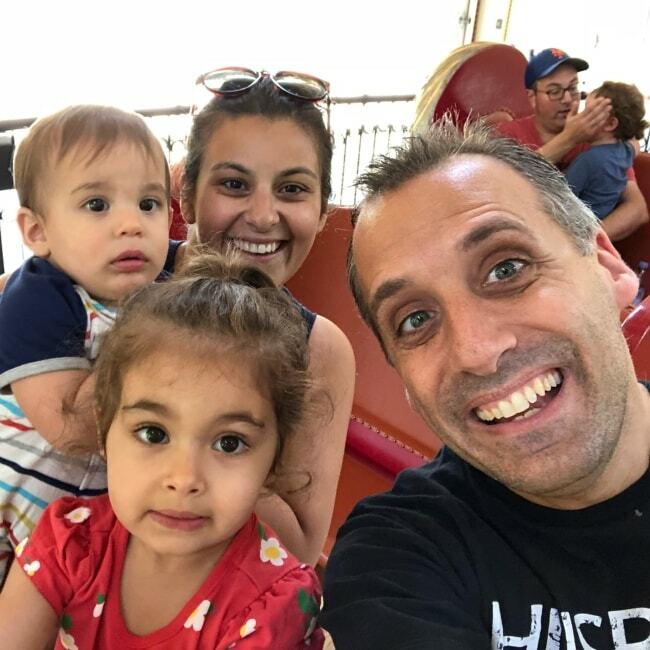 Having achieved a good measure of wealth and fame for himself, Joe Gatto added a touch of romance to his growing career by getting married to his wife Bessy on the 2nd of September, 2013. In her own little way, Bessy has been her husband’s number one fan and has been very supportive of his efforts. She advertises his shows through her social networking platforms and this continues to bring more followers for her husband. Their union has been blessed with three amazing kids. A girl Milana Francine as the first child born on the 7th of May, 2005 while the second, a son was born on the 9th of February, 2017. Finally, Remington Joseph Gatto was born on July 31, 2017. Joe’s popularity as a comedian and actor has been on the rise over the years and this have actually been reflecting on his net worth which is pegged at $500,000. But seeing as he seems to be heavily involved in charity, it speculated that he is possibly worth more. Moreso, his career is seeing a significant increase with every new show. Joe stands tall at 5 feet 10 inches with a commensurate body weight of 85kg.